Alzheimer’s disease is one of the fastest growing threats to Americans’ health, but University of Iowa researchers like Guanghao “Max” Liu—a neuroscience graduate student within the Medical Scientist Training Program (MD/PhD)—are determined to discover the mechanism that causes this debilitating neurodegenerative disease. Tau and beta-amyloid peptides—which form plaques and tangles that are considered informative predictors of Alzheimer’s disease—change how the brain works many years before the first sign of memory loss. For the more than five million Americans living with Alzheimer’s disease, recent research on tau provides hope that breakthroughs may be on the horizon. Assisting Liu in his discoveries is the recently established Kwak-Ferguson Fellowship. Liu is the first recipient of the award, which is helping him advance his research, travel to conferences, and meet with other scientists in the field. 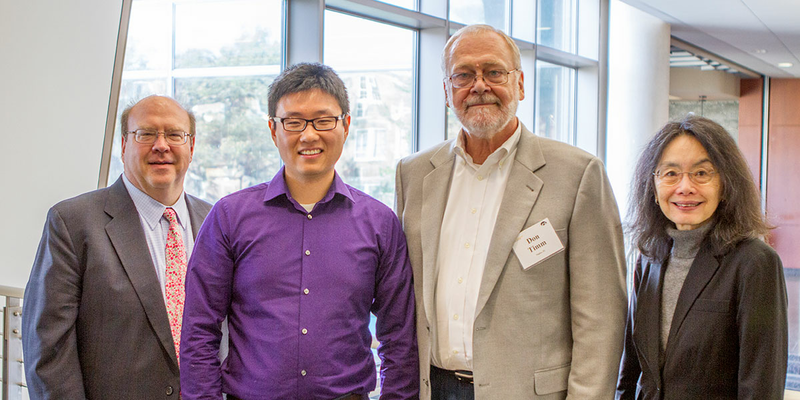 Photo: Mark Stastny Pictured from left are Ted Abel, director of the Iowa Neuroscience Institute; Guanghao “Max” Liu, a neuroscience graduate student; Donald Timm, who created the Kwak-Ferguson Fellowship; and Gloria Lee, professor of internal medicine. The Kwak-Ferguson Fellowship was established by Donald Timm (73JD), a Muscatine, Iowa, native who spent more than 30 years working for the U.S. Department of Defense as an expert on international law. He created the fellowship in honor of two individuals—his friend and mentor, Mr. Myung-Duk Kwak, a Korean attorney and statesman, and his aunt, Louis A.M. (Amelia Marie) Brown Ferguson, an educator and missionary—both of whom died due to complications from Parkinson’s disease. Timm also says he was motivated, in large part, by the Roy J. Carver Charitable Trust’s gift to establish the Iowa Neuroscience Institute at the University of Iowa, which is developing new treatments for neurodegenerative disorders, including Alzheimer’s disease and Parkinson’s disease. For Liu, the fellowship is helping him become an even better physician-scientist and writer. “Because of the Iowa Neuroscience Institute and the Kwak-Ferguson Fellowship, I am ready to tackle any challenge in the future,” says Liu. To learn more about how you can support neuroscience research at the University of Iowa, please check out their website.